On the 11th of May 1889, British Surrealist painter and war artist Paul Nash was born in London. The older brother of the artist John Nash, he started his professional education at the Chelsea Polytechnic, from which he moved on to the London County Council School of Photo-engraving and Lithography. Eventually, after being spotted by Selwyn Image, and following his advice, he entered the Slade School of Art at University College, London, where he studied drawing under Professor Henry Tonks. He came relatively late to oil painting and only began to use it regularly for his commissions as a war artist around 1917, when, after suffering an injury on the Western Front he was sent back to London to recuperate. Having experienced firsthand the harshness and brutality of war, he immersed himself in producing the most captivating landscapes which confronted the ideal of the poetic landscape with the physical consequences of war. wow that was interesting read. thank you for posting!!! 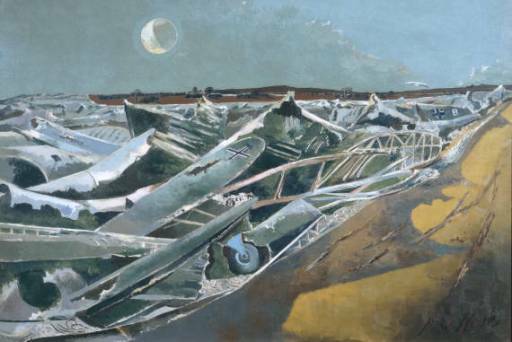 Paul Nash is a great British painter. His paintings dramatically and subtley show the horrors of war. Of course he did many other paintings. I also like John Piper. Are you going to post something about him?